Brad Flegel, Jarrett Flegel, Murray Flegel, Kien Luong, Gray Savage and Steve Jakubec. Much has changed in the 25 years since Murray Flegel opened the doors of BOSS Lubricants. The company has grown, expanded, and established itself as one of Canada’s largest independent lubricant manufacturers and wholesale suppliers of premium engine and transmission lubricants, natural gas compressor oils, greases, and glycols. With coverage from coast to coast and an impressive head office and manufacturing facility in Calgary, BOSS is proud of its Canadian roots. BOSS was and remains a 100 per cent Canadian-owned company with products that are developed for the challenging Canadian climate. Back in 1992, it was a true family team effort. Murray’s wife, Arlene, did the bookkeeping and invoicing while Murray took care of sales and operations. Murray’s knowledge in the lubricants industry was obtained while spending more than 20 years with Texaco and Turbo, after his professional hockey career came to an end. While getting their education and business degrees, sons Brad and Jarrett worked part time to help their dad out. “I worked my way up through the company doing pretty much every job except accounting, working for $5.70 and hour,” says Jarrett, who is currently the president and COO of BOSS Lubricants. In 1996, Murray brought in a silent partner, Bill Dickson, whose business expertise and vast knowledge helped guide the company to the size and success it enjoys today. Since Bill’s unfortunate passing, the company has dedicated the Make it Happen award to a recipient within the company that demonstrates Bill’s passion for a can-do attitude. “As the company grew, so did our workforce and delivery fleet, which offers industry-leading service,” says Murray, founder and CEO. In 1999, Jarrett graduated from Mount Royal College with a Small Business and Entrepreneurship degree, and extended his education years later by attending the Queen’s University’s Executive MBA program. Older brother Brad graduated in 1994 from the University of Calgary with a Commerce degree and went into the oil and gas industry, holding various positions with companies like Barrington Petroleum, AEC, ENCANA, and Niska Gas. BOSS’ first taste of expansion came in 1996 when they acquired Service Station Supply in Red Deer, which is where they met current 20-year employee Kien Luong. On a daily basis, Kien organizes ordering and shipments to and from clients and suppliers, ensuring adequate amount of materials are on hand for in-house blends, pricing, purchases, and orders for all products. He also reviews results of quality control testing and identifies and troubleshoots areas where BOSS can save costs and improve operating inefficiencies while ensuring that the integrity of BOSS Lubricants’ product line is maintained. Over the years, and through ongoing customer growth and other opportunities, BOSS has strategically positioned themselves in Surrey, Edmonton, Red Deer, Lethbridge, Saskatoon, Regina, Brandon and Toronto. Due to BOSS’ diverse product offerings and service area coverage, BOSS has been able to overcome challenging economic times. Today, BOSS services over 4,500 customers across Canada, supports over 150 distributors and has recently expanded its exporting position internationally. With service being at the forefront of BOSS’ business model, BOSS boasts one of the largest internal delivery fleets in Canada and is provided with dedicated shipments from its partly-owned highway tractor and trailer company, BOSS Hauling, which, operated by the Linn family, has successfully delivered same and/or next-day service to BOSS Lubricants’ facilities since 1998. Also lending strength to the company is Steve Jakubec, general manager and controller, whose initial focus when brought on board in 2008 was to upgrade systems and standardize processes throughout the company. Steve works closely with the sales team to help them achieve operational goals. “We have implemented a custom system that is tailored to our unique manufacturing process, allowing BOSS to better control costs and operational efficiencies to better serve our customers,” Steve says. The company moved into its location on 30 Street SE in 1996, with 26 tanks. Today, BOSS has over 99 tanks ranging in various sizes from 8,000 litres to 100,000 litres. Raw materials are pumped in, blended, tested, packaged and distributed from this facility. It produces everything from gas engine oils, diesel engine oils, gear oils, tractor fluids, grease, environmental products, transmission fluids, hydraulic oils, and synthetics. 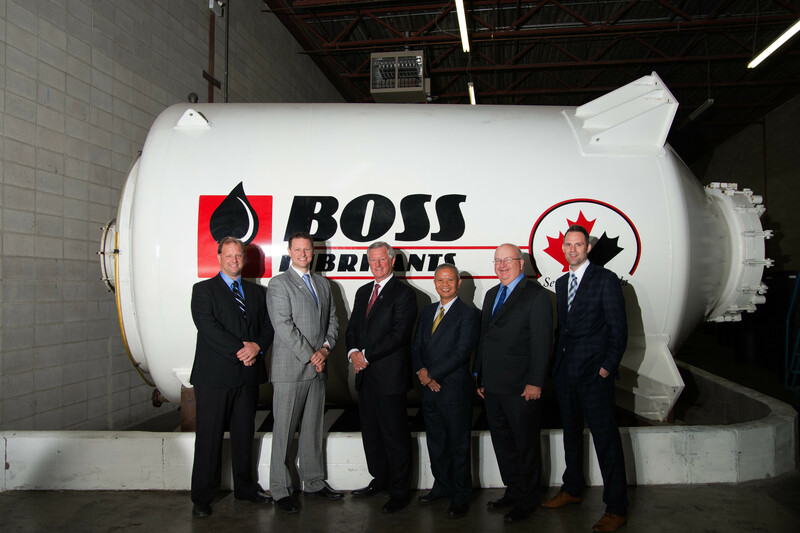 BOSS Lubricants’ Edmonton facility handles all anti-freeze and heat transfer fluids blending, packaging, terminalling, and storage. By keeping tanks out of Calgary’s extreme elements and in a more controlled environment, BOSS can manufacture a higher quality product. “Water or condensation is the evil enemy of lubricant, so we ensure we don’t have any outside elements in our manufacturing processes,” says Jarrett. Two years ago the Flegels bought the Calgary building it is headquartered in, which now sprawls 80,000 square feet. It has expanded to include five blending tanks capable of blending 10 million gallons of product each year, with the ability to increase output, if required. BOSS can fill tank trucks, drums and totes. The company has invested in some of the best technology to fill 1 litre, 5 litre, and 20 litre pails. Quality is another important core value for BOSS, and the company’s commitment to this is reflected by their “no nonsense warranty”. There are more than 200 industrial oils and lubricants in BOSS’ repertoire that cover the gamut of requirements for a variety of industries. BOSS is proud to be meeting the needs of its diverse retail, industrial and commercial clientele; and in order to better serve these valued customers, BOSS introduced a secondary line of products as well. “We’re always looking to expand our product lines to meet customer demands based on industry trends,” says Steve. BOSS has recently become the exclusive Western Canadian distributor for Mag 1, which features aerosol glass cleaners, brake cleaners, and leisure products. This makes it more convenient for BOSS customers to get everything they need from one location while complementing BOSS’ already extensive product line. Under this one-stop shop strategy, the company has also recently launched a full line of batteries called BOSS Power. Customers needing batteries for everything from large highway trucks to jet skis can get them at BOSS. Customers’ needs come first at BOSS. In order to be more competitive, Flegel bought the six-car rail spur behind the facility for easy access to raw materials. This strategy has given BOSS an economic advantage. Competitors may bring in one tractor trailer per week of materials by road while BOSS is bringing in four to seven railcars per week. Some of its tanks can hold an entire railcar worth of product, so it can order in bulk and pass the savings along to customers. “It’s important for our customers to get that value discount as a result of our buying power,” says Jarrett. BOSS stands for Bulk Oil Sales and Service, and it is that second “S” that really sets the company apart from the competition. Despite the size of BOSS’ client base, it still uses the small family business approach. Part of the culture at BOSS is the expectation that its employees answer the phones within three rings rather than having call centres or patching callers through to automated directories. BOSS cares about customers and their needs, and this is just one way to show it. Account representatives go see clients in person to build and foster their business relationships. They want to show clients and potential clients the value of the BOSS brand and how the best quality doesn’t always cost the most. Sometimes it is difficult to switch away from a major branded product, so management encourages clients to test out the product or perform an oil analysis if they are not convinced—and with the best warranty in the business, there’s no risk. Once customers give the products a chance, they are glad they did. BOSS works hard to get earn its clients’ business and works even harder to keep it. “We prove to them, day in and day out, that they made the right decision,” says Steve. BOSS, on average, services 150 customers per day. In fact, many customers have been with Murray since he started up 25 years ago. Management is proud to have long-term customers. That dedication comes from the top down at BOSS. Management fosters an environment that encourages teamwork and accountability. The culture at the office is one of family. The Flegels value their employees and enjoy getting to know them during office hours and outside of work. Through staff barbeques, parties, lunches and family events, as well as friendly conversations and greetings throughout the workday, management lets employees know they are important and cared for. In return, the staff is loyal to BOSS and is invested in its success. BOSS is also proud of its commitment to lessening the company’s environmental footprint. The Regina location has a drum reconditioning plant and the Saskatoon location operates a tote reconditioning plant. The company gives back to causes that are important to BOSS as well as to its customers. Murray is the past president of The Rotary Club of Calgary South and supports many of its charity events. BOSS also supports Youth Unlimited and the Motive Action Training Foundation, which helps provide youth and adults gain access to fundamental work and life skills. The company also donates oil to local community initiatives and charities. Each year employees across the country volunteer time at food banks and support charities such as cancer foundations, Heart & Stroke Foundation™ and the Aga Khan Foundation. “We are very big into our community and giving back,” says Jarrett. BOSS management and staff are also sports fans, and the company supports sports teams from four-year-old Timbit hockey players and adult recreation leagues all the way to professional local sports teams. The spors focus is no surprise, considering Murray Flegel’s first career was on the ice, not in the business world. As a member of the Montréal Canadiens minor league, Flegel played professional hockey for 10 seasons and was awarded the International Hockey League’s (IHL) Governor’s Trophy two years running for being the top defenseman in the league. He has brought these two passions together in his Calgary office. Upstairs is more museum than workplace, as Flegel has his incredible collection of hockey memorabilia displayed on the walls and in cases to share his passion with the staff. “After all, this is our home away from home. We spend more time at the office than at home,” says Jarrett. But Murray may soon be spending more time south of the border than at the office. After devoting a quarter century building BOSS Lubricants, he’s beginning to plan for partial retirement. “I don’t know if my dad will ever let go fully. We’d like to see him spend more time down south with his friends because he’s earned it. He deserves it,” Jarrett concludes. This is a “CLASS ACT”! article. Very well done! This shows with perseverance and drive you can accomplish your dreams. Hats off to Murray Flegal and Team!